Caramel Crunch Hand-Scooped Ice Cream Malt - Creamy, hand-scooped ice cream blended with real milk, malt powder, caramel sauce and crunchy oats, then finished with whipped topping. Doesn't that sound delicious?? How about a couple of good Hardees coupons that will save you a few bucks? 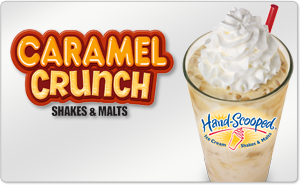 First - $1.00 off Caramel Crunch printable coupon, valid until July 2/119 - Bring the coupon to your nearest Hardee's location to get your discount. Next sign up for emails from Hardee's so you don't miss out on their exclusive offers and free stuff! As soon as you sign up, you will be sent a printable coupon for a Free Small Fries and drink with purchase of a Thickburger.